We are glad you are interested in Weatherford and hope you find it as wonderful as we do. 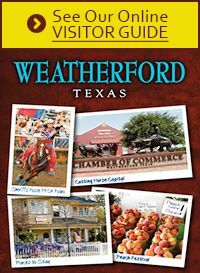 Weatherford is the type of community where the citizens are involved in numerous clubs and service organizations, where the entire town roots for the home team, and where people still smile and say "hello." Take your time exploring this website and contact us if you have any more questions. We'd be happy to answer them.